Fancy a visit to the snake farm? When you see this sign, you know you’re at the right place. It is a sunny Sunday afternoon and the kids are driving us crazy! What to do in this neck of the woods? 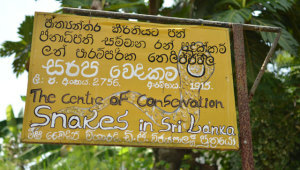 Let’s go and visit the snake farm behind Weligama. 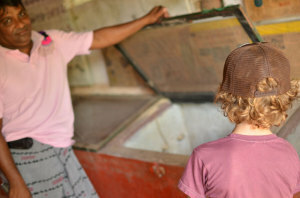 After a good 40 minute TukTuk ride with Uncle we finally arrive at the place, which is not very easy to find. It’s been a snake farm for three generations. Wikman Bandara (40 years old) is now in charge. His father Wijepala Bandara is 76 years old and still practices Arjuvedic snake medicine. Grandfather Gemis Appuhami died at the age of 86 in 1974. Miles checking out a cage. 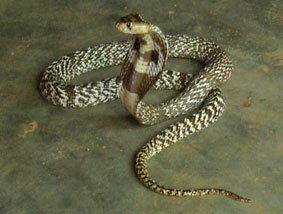 There are 72 different snake families in Sri Lanka of which seven are very poisonous. At the snake farm there are 20 different families present and on average 25 snakes are released into the wild every year. It takes a bit of getting used to the fact, that the snakes are kept in pretty dull concrete boxes with wooden lids (some of them secured with an extra nail or two). Wikman can get every snake out of its cage. You can hold them or just watch. I must tell you, my kids always ran screaming into the opposite direction, whenever he got a snake out. … but some kids are braver than others. So what should you do if you find a snake, especially a poisonous one, in your own garden? Apparently they can’t stand the smell of petrol, so spilling a few drops will make them run head over heels. Better go and fill up that jerry can…! 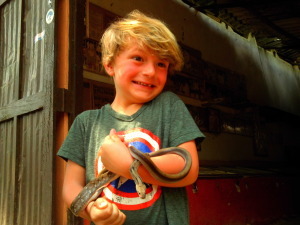 The snake farm gets around 20 visitors a day and the entrance fee is LKR 800,- per adult and LKR 400,- per child. Grace enjoying some Elephant House icecream. On the way back through Weligama you can stop at the Icecream man along the beach road and give your brave little snake charmers some reward. Easiest way to get there is by Kapila taking you there. Posted in Family friendly, What to do? Hey, nice seeing you here! Signup today for exclusive special deals not available on the website.